Comcast’s Gigabit Internet allows up to 1-gigabit download speed for employees within a company, which is estimated to be 80 times faster than the average internet access speed in America. With this service, businesses in Miami now have enough speed to connect more devices, allowing them to run their businesses on faster and more reliable network. 1.1 How fast is it? Comcast Cable is one of the nation’s most extensive video, high-speed internet and phone providers to residential and commercial consumers. This company has built one of the largest gig-speed networks in the country. This new service uses DOCSIS 3.1 Technology, which enables users to receive gigabit internet speeds over communications line that most users already have connected in their homes or offices. Companies can now look forward to fast, reliable internet connectivity throughout their enterprise, which essentially means improved productivity. Companies can now run multiple backups, services, and cloud-based apps all at the same time without having to halt one for the other to work. 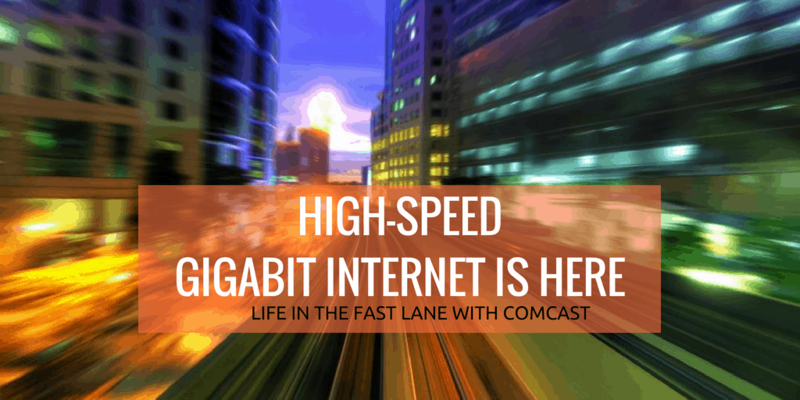 Designed to fit most business and its budget: With Comcast, Gigabit Internet companies can count on speeds that are 20x faster than what other internet service providers offer at a relatively more affordable monthly price. According to Comcast marketing team, users will now be able to download files as big as 5GB within 40 seconds and 15 GB content in less than 2 minutes. Swift and simple installation that eliminates disruptive construction. As consumers and businesses across Miami continue relying heavily on the internet, Comcast Gigabit has the advanced technology required to meet this ever-growing demand. Comcast Gigabit can now deliver gigabit speed internet across Miami over a network that is already serving thousands of homes and businesses in the area. This technology uses existing communication lines, meaning that users do not have to worry about the costly and disruptive construction of new network facilities. This will benefit even small businesses that need faster download speeds on a budget. Comcast Gigabit Internet Miami enables enterprises to deploy gigabit services more widely across its existing network, allowing them to reach more customers. Comcast also gives users access to millions of WiFi hotspots across the state. The user can enjoy hot spot internet services at no extra cost. They also provide access to a new set of security features at some selected hotspot points across the country. Comcast’s gig-speed networks enable businesses to quickly and easily scale the network capacity to best suit their unique needs and to support new technology applications both on-site and in the cloud. Businesses of all sizes in Miami, whether a small company with one location or a distributed enterprise with multiple locations across the country can now easily move to cloud-based operation models. Thanks to its speed and cost efficiencies, this new internet service is suitable for businesses across several industries, including government, manufacturing, hospitality, retail, and healthcare. The residential service run at $140 per month without the need of a term contract and business plans start at around $300. • HostingxFI – a free network platform that allows users to customize, personalize and control their WiFi experience. • Multi-Gigabit speed tiers are also available to large enterprises. Over the past 17 years, Comcast has been able to increase their internet speed 17 times over. 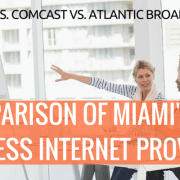 Business Internet 1Gigabit and Business Internet 500 Mbs speed tiers are available to business consumers in Miami, Florida. These new tiers complement the multi-gig options that are already available to Comcast business customers. These tiers include Comcast Business Ethernet that the company launched and has been expanding since 2011. So there you have it. Gigabit internet is no longer just a catchy headline in a tech magazine, it’s here, and it’s readily available to almost everybody in the Miami area. However, before you dive in, make sure your internal network is up to par and ready to receive gigabit speed otherwise you are paying for a service you can’t fully take advantage. You need to make sure your router, network switch, workstations, cabling and wireless access points are all up to date. If you are not sure, you can take advantage of our Free Technology Assesment where we analyze your network and help you find ways to improve your IT setup.